Nestling on the shores of the Solway Firth, facing the hills of Dumfries & Galloway and backed by the Lake District Fells, Silloth, the popular seaside resort in Cumbria’s Western Lakes and Coast, is noted for its invigorating but mild climate: its leisurely peaceful atmosphere and perhaps, most of all, its glorious sea views and sunsets fine enough to be recorded for posterity by Turner, the famous landscape artist. 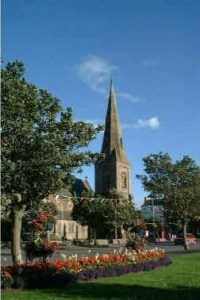 Silloth gets its name from the time when Cistercian monks from Holme Cultram Abbey, at nearby Abbeytown, stored their grain in silos known as lathes, because these were beside the sea they were known as sea-lathes and over the years this was changed to Silloth. In those times Silloth was only a hamlet and it was not until a decision was made to build a dock and a railway that the town was developed. Imaginative planning can be seen in Silloth’s wide elegant tree lined streets, magnificent promenade, which is excellent for a walk with scenic views across the Solway Firth to the Dumfries & Galloway Hills in southern Scotland, and spacious sea front Green. Today The Green is used by many for recreation, there is a paddling pool, sand pit and tennis courts, and for those not so energetic plenty of seats to sit, rest, relax and admire the wonderful views. Christ Church overlooking The Green is a feature of the townscape and one of several denominational places of worship. The Church was designed by a Carlisle man and built in the 1870’s of granite, imported from Ireland, sandstone and brick. Christ Church still retains its original design with no additions having been made to the building. Silloth also retains a busy dock. A small fishing fleet is harboured here and still operates today catching Solway Shrimps which are transported countrywide. Silloth’s sandy West Beach is a playground for children, ideal for picnics and fishing and has been awarded a prestigious Yellow flag by the Tidy Britain Group. For those seeking the ultimate in solitude and relaxation the wildlife of the Solway Marshes is only minutes away. The area around Silloth includes inter-tidal saltmarshes and sand-dunes which are designated as Sites of Special Scientific Interest because of the richness in rare plants, birds and other animals. The Solway Coast around Silloth has been identified as an ‘Area of Outstanding Natural Beauty’ because of its unique coastal landscapes and habitats. Historically the area is very important and has been designated a World Heritage Site because of it’s Roman military remains which formed part of the Hadrian’s Wall defence network. Visitors will find plenty of things to do in Silloth. The Green offers many activities a putting green, amusement arcade, Water Splash park & a children’s woodland adventure play area. During the summer months various festivals etc are organised which includes the Silloth Green Day in May, Vintage Rally in June, Kite Festival in July, Carnival in August and also a Music & Beer Festival in September. The main Holiday Parks have swimming pools and leisure centres which are available for non-residents use. There are plenty of places in and around the town to explore by bicycle or on foot. Night owls will enjoy Silloth’s varied entertainment, ranging from local pubs to the holiday park’s bustling nightclubs. Primarily a residential area, attractive to not only retired people but also to those who welcome living by the sea in attractive rural surroundings. There is a thriving community spirit with many clubs and organisations using the facilities within the town.